Want good sound? It'll cost you. We’ve looked at a bunch of Beyerdynamic headphones recently from expensive open-back headphones that need amps to drive them to gaming headphones. But now the company is making wireless options and, like all of its products, the focus is on sound quality. The Amiron Wireless are a pair of Bluetooth headphones aimed at the person who wants a premium audio experience with no strings attached (I couldn’t resist). But is that person you? Someone with a deep pocket. Right off the bat, it’s important to say that these are expensive. If great sound quality is really what you’re after, then there are plenty of other options that will sound just as good for less—including some offerings from Beyerdynamic. But if you want that in Bluetooth form, then these are worth putting on your shortlist. Someone with a backpack/briefcase. Bluetooth headphones are meant to be portable but these are too large and bulky to use daily, unless you have a place to stash the included hardshell case when you’re not using them. If you’re going to be wearing these while cleaning or relaxing on the couch, these are for you. They’re like a listening station for your ears. Anyone who has hearing damage. The Beyerdynamic app gives you a quick hearing test during setup. Then it changes the sound coming from the headphones to compensate for each individual’s hearing abilities. That in itself is pretty cool, but what’s even cooler is that you can choose just how much you want the custom EQ to affect your music—thanks to a slider between 20 percent and 100 percent. So it isn’t just with or without the custom EQ; you can have a mix of both depending on your preferences. The ear cups don’t rotate and the adjustable metal band don’t have hinges for folding, so portability is a bit of an issue. Let’s just get this out of the way. The Amiron Wireless headphones are beautifully built. They have an almost industrial design of metal and plush padding that makes them feel sturdy and a little heavy at times but in a good way. Putting them on feels like you’re wearing a very comfortable helmet. The padding provides a great seal that, when combined with the plush material and metal build, do a great job at passively isolating outside noise. That said, I did find these to be too loose, and if I looked away too quickly or shook my head a little, they came flying off. The padding on the ear cups feels like they’re wrapped in microfiber cloth, which makes them super comfortable to wear for longer listening sessions. I managed to make it to about five hours of listening before I felt the need to take them off, and it wasn’t because of comfort. They just got too warm for comfort after a while. I’m sure this won’t be as much of an issue in the winter, but with summer on the way, it did get pretty warm. The padding on the ear cups and headband are both extremely comfortable for long listening sessions. The headband is wrapped in a similar padding, but the rest of the Amiron Wireless is made of cold metal. As much as I like the build of these headphones and how they feel in the hand, I’m not the biggest fan of the design. As I mentioned these are pretty large, but the silhouette makes them look even larger when you’re wearing them. You can kiss any chance of blending into the people around you goodbye. These will make you stand out like a sore thumb, despite the minimal aesthetic. If you don’t really care, then this obviously isn’t a problem for you. That said, I usually try to avoid showing expensive tech to people around me, and these look expensive. But the large size also means that carrying them around is borderline impossible—unless you have a bag. The headphones don’t fold at the hinges and the ear cups don’t rotate flat; although, they do swivel a bit to help you get a better fit. Letting them drop to your neck when not in use makes you look almost comical and definitely isn’t comfortable. Naturally, you’re going to need a bag. The Amiron Wireless has plenty of codecs for high-quality streaming, save for Sony’s LDAC. As far as functionality goes, the left ear cup is entirely blank with nothing but the Beyerdynamic logo printed on it. The right ear cup, on the other hand, has the power button/Bluetooth pairing button, a 3.5mm input, a USB Type-C input, and then the touch-sensitive pad on the side for controlling music playback. The touch-sensitive part is made of metal and feels like the trackpad on my Macbook Pro, but the controls aren’t as intuitive. In order to properly access the playback controls, you have to be a intentional—or robotic—with your movements. The touch-sensitive ear cup allows you to skip between tracks by swiping left or right, fast-forward or rewind by swiping and holding, and control volume by tapping up or down (or swipe and hold). You can also pause or play music by double-tapping the center of the pad and access the personal assistant on your phone by tapping once and holding. I know what you’re thinking,”Wow, that’s a lot to remember.” And you’re right. It is, but it isn’t rocket science. After a while, you get used to it; I’d be lying, though, if I said it was intuitive. I had to actually look at the manual to figure out exactly what all of the controls are. And if you don’t swipe across the entire area of the ear cup, then the headphones won’t register; though, you can change the sensitivity in the app. While the touch pad on the left ear cup has all of the controls, the right ear cup only has the Beyerdynamic logo. Speaking of the app, it’s probably the best one I’ve ever used that comes from a headphone company. Plenty of headphones come with an accompanying app, but this one actually feels like it’s useful. During setup, you can take a quick hearing test that tests your left and right ear to see how much you can actually hear. Then it adjusts your music accordingly, so you get the full experience. As we’ve mentioned plenty of times before, everyone hears differently. Seeing Beyerdynamic taking steps to resolve that fact is great. When it comes to Bluetooth connectivity, Beyerdynamic didn’t skimp out on any of the good stuff. As a company that prioritizes sound quality, these have almost all of the Bluetooth streaming codecs, save for LDAC, which is exclusive to Sony. But you still get aptX, aptX HD, aptX LL, AAC, and—of course—SBC. Though it’s worth mentioning that in order to get aptX HD, you actually have to turn it on by pressing the power button for two seconds while simultaneously dragging one finger upwards on the touchpad. Why? I have absolutely no idea, and if I hadn’t gone looking for the instructions on how to control playback, I would’ve completely missed this. Why they didn’t just add a section for this into the app is beyond me, but there you go. If you don’t feel like going wireless, you can also just plug in the included 1.2m audio cable. Though to be fair, all of the testings I did was wireless because that’s kind of the whole point of these headphones existing. Beyerdynamic doesn’t specify exactly how long the battery life is, but it is mentioned that it’s greater than 30 hours of constant playback. In our testing, we got 26 hours with the volume at 100 percent, so it isn’t hard to see how they can last way longer if you’re listening at regular volumes. Here is where all the issues that I had with these headphones are forgiven. They sound really, really good. I haven’t this much fun reviewing a pair of headphones in a long time. I kept forgetting to listen critically and just ended up singing and dancing along to my favorite songs, which—in my opinion—is exactly what makes a good pair of headphones. Dynamic Tesla drivers are covered by a soft padding that provides a great seal. The drum kit at the beginning of the song Rillo Talk by Wild Child has the perfect amount of power and stays just as consistent throughout the entire song, even when the bass guitar and other elements find their way into the song. As you can probably guess from how I described these headphones earlier, they’re pretty fun to listen to. The lower notes seem to have a bit of a bump that, while I wouldn’t call these bass-heavy, give them a slight exaggeration when compared to the mids. That’s not to say that the mids are bad; in fact, they’re far from it. Everything going on throughout the song Holland Road by Mumford & Sons came through loud and clear, but that wasn’t the case with every song. Songs that were instrument-based seemed to have good separation between instruments in the mids, but songs that were more electronic didn’t follow suit. For example, the vocals in the song Myself by J Mars were masked at times by the rolling synth throughout the song. On the bright side, hi-hats sounded great and were definitely helped by the fact that these headphones have an impressive soundstage. I wouldn’t go as far as saying that it sounded like there was a drum kit in the room, but compared to other Bluetooth headphones we’ve tried the large ear cups definitely help give you a sense of space in the music. 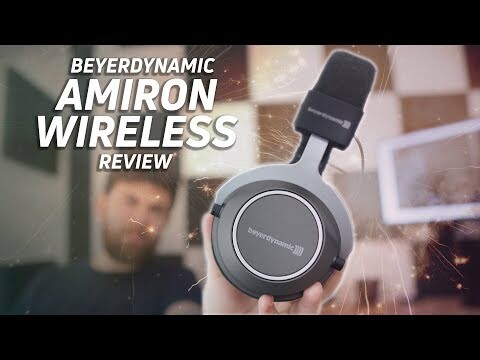 In the end, the Amiron Wireless fall perfectly in line with the rest of Beyerdynamic’s high-end headphones. Though these are wireless, they’re not exactly the best if you’re going to be walking around the city or commuting to work. Just like their open-back headphones, however, these are easy to recommend to anyone who wants to hear their music clearly but still have some fun with it. You might be able to get away with using these for mixing audio because there isn’t a ton of embellishment,. But that’s not why I would buy these. There are much cheaper headphones that are much better at that. If you’re buying these, it’s because you have money to blow and want the best sound a pair of Bluetooth headphones can offer—even if they do make you look like you have robot ears. Experience your favorite music in a new and different way. Discover your favorite songs all over again with the pioneering beyerdynamic MIY app (“Make it yours”). At the heart of the MIY app are the award-winning sound personalization features developed by Mimi Hearing Technologies. A certified test allows you to analyze your own hearing. The Amiron wireless then adapts the sound precisely to your personal hearing profile – amazing you with an entire world of details that you never before knew could be heard.